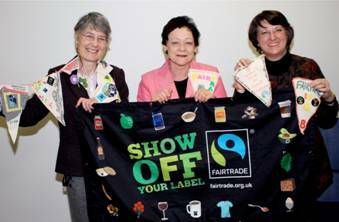 Wandsworth MEP Sarah Ludford Supports FairTrade! Sarah is pictured above with LibDem MEP colleagues Fiona Hall and Catherine Bearder with the Fairtrade bunting that is set to break national UK record for the longest string of bunting! As part of Fairtrade Fortnight over the last two weeks, groups across London organised and took part in events to raise awareness of the importance of buying Fairtrade products. Buying Fairtrade cotton, coffee or sugar helps 7.5 million people in the developing world (producers and their families) get a fairer, stable price for their products and a secure livelihood. "It is a great achievement that all the Tate & Lyle sugar that customers buy in shops and supermarkets, produced at the refinery in east London, is now Fairtrade. Now we need to demand that industrial customers of Tate & Lyle - the manufacturers of our favourite biscuits and puddings - also buy Tate & Lyle Fairtrade sugar!"